Center Pull-Tab Plugs are available without flange. Series CPT-NF center pull-tab plugs are suited for use in tight spaces where 2 or more openings to be plugged and there is no room for a flange. Available in 7 different sizes, plugs are manufactured in Low Density Polyethylene heat resistant to 175Â°F. Units are designed with durable pull-tab, and come in standard orange color. 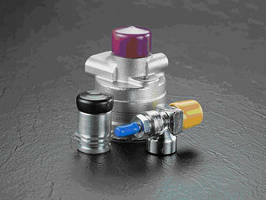 (Buffalo, NY) - Caplugs introduces a new series of center pull-tab plugs without a flange. The CPT-NF series is ideal for use in tight spaces. Commonly used when there are two or more openings to be plugged and there is no room for a flange. These parts can also be pushed deep into ports that need the plug to sink below the surface of the opening. Designed with a durable pull-tab to ensure quick and easy removal. Available in seven different sizes, CPT-NF plugs are manufactured in Low Density Polyethylene heat resistant to 175°F. The standard color is orange, but we have a wide variety of colors available requiring a slightly longer lead time. Standard size and color CPT-NF's are in stock and available for same day shipment. Visit www.caplugs.com to view the entire product line, request literature and free samples, or place an order. To speak with a customer service representative, call 1-888-CAPLUGS. Caplugs are distributed in Canada through Daemar Inc., 861 Cranberry Court, Oakville, ON L6L 6J7; 548 Rue Meloche, Dorval, Quebec H9P 2T2; Unit 25, 1610 Derwent Way, Delta, B.C. V3M 6W1, and 4472-97 Street, Edmonton, AB T6E 5R9.